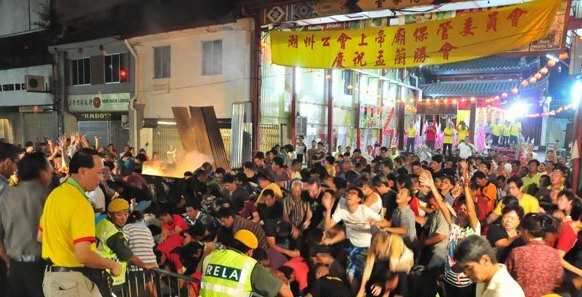 The Kuching Teochew Association celebrated the Hungry Ghost Festival at Hiang Thian Siang Ti Temple, Carpenter Street here in conjunction with the festival which falls on 10th August. Devotees, tourists and others gathered around the temple around 6:30pm to participate and witness the spiritual ceremony. The ceremony started with a series of prayers, burning of joss sticks and paper money known as hell bank notes to appease the wandering spirits. Food were also prepared for the spirits during the ceremony. The Hungry Ghost Festival is celebrated on the 15th day of the seventh month of the lunar calendar and it is a tradition annualy practised by the Chinese Community.